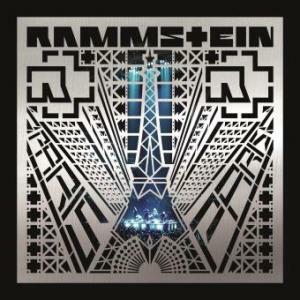 Rammstein have no "secret plans" to a "farewell album"
According to official sources, Rammstein have no plans to retire after the album that is to be released soon (probably this year). Here, at Affenknecht, we believe that according to our calculations Rammstein will release 2 more albums (or 3 albums if Till will be able to sing at age of 102). We have considered the exponential increase in waiting time. It is now 8 years since LIFAD, which was released 4 years after Rosenrot. So the next album after the one expected this year will be published in 2033 when Till will be 70! We see singers like Ozzy Osbourne able to record new albums, so why not Till? But for the 2065 date we already share some doubts that Till will be in shape. 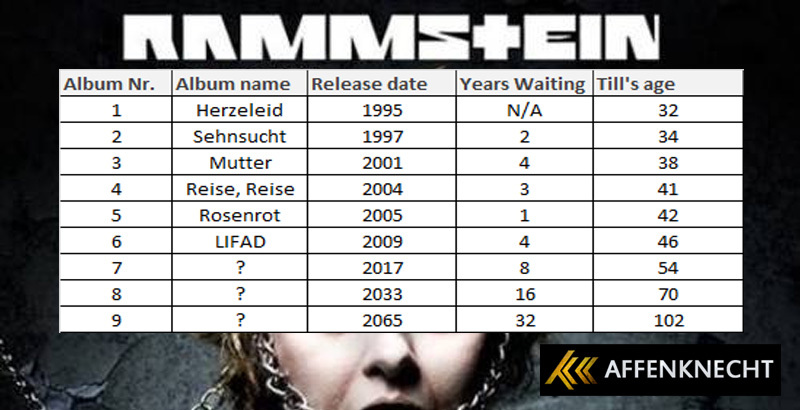 Are you wondering why there was only one year waiting time for Rosenrot? It is simple – songs for Rosenrot were recorded during the Reise Reise studio shoot and basically Rosenrot is a second part of the Reise Reise album. Happy birthday to Till Lindemann! If Till is still able to record songs, like the amazing ones we already have from Rammstein, at age 102 I think I might renew my hope for humanity. Modern medicine is also improving at an exponential rate, did you take this into account?